Evelyn turned nine months old today. We took her to the doctor's office this morning and found out that she weighs just over 16 pounds and is 27 inches tall. To celebrate, we took a walk in the park and went on the swings. It was an unseasonably warm day for Pittsburgh in mid-December, with temperatures approaching 60 degrees. 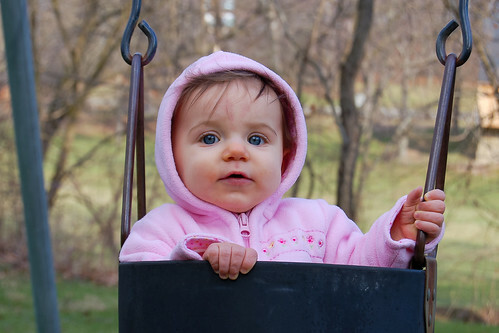 We can't assume that we'll be able to do the same outdoor activities when Evy turns ten months old. Maybe we'll get to build a snowman instead. Looks like she's sitting on a swing in giant-land. You could probably fit three of her in that swing before she'd start getting uncomfortable. Good luck to the Predacons in getting 5th place. Have a great holiday! No snowman yet. Maybe, if the temperatures don't get themselves straightened out, we can play in the sprinkler, or take a walk through the spring flowers on Christmas day. The weather sure is goofy. What a nice spring day for a swing in the park. She seems to have a stronger stomach than either her mother or father when it comes to motion! Have a fun time in the park.